Courtesy of Michael Van Valkenburgh Associates Inc. Although the University’s plans for completing its first science building in Allston remain uncertain, it is proceeding with community amenities promised to the neighborhood as part of the long-term ambition to develop academic facilities there. In July, Harvard planners unveiled preliminary designs for a new public park scheduled to be installed behind the local branch of the Boston Public Library, on North Harvard Street. 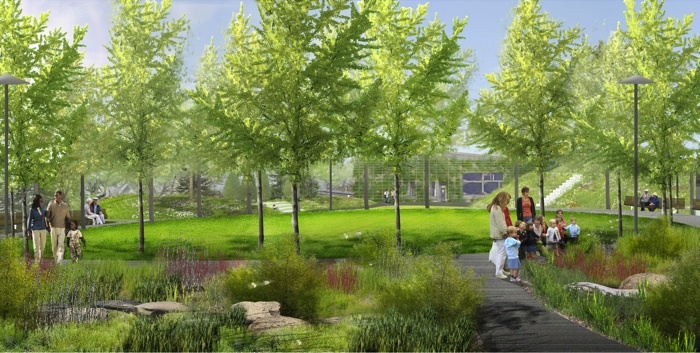 Intended to provide reading spaces and other natural amenities, the park (rendering above, courtesy of design firm Michael Van Valkenburgh Associates Inc.) is scheduled to be constructed beginning next spring. The Camille and Henry Dreyfus Foundation has conferred its inaugural Dreyfus Prize in the Chemical Sciences 0n Flowers University Professor George M. Whitesides. The biennial prize, with a monetary award of $250,000, recognizes outstanding research in chemistry—in this case, work in materials chemistry. Whitesides is a leader at Harvard in nanoscale research with implications for biology (as described in “Thinking Small,” January-February 2005, page 50). Separately, Petschek professor of mathematics Clifford H. Taubes was named cowinner (with Simon H. Donaldson of Imperial College London) of the $1-million Shaw Prize, for distinguished, significant advances in three- and four-dimensional geometry, drawing upon insights from theoretical physics and quantum theory. Taubes, a member of the National Academy of Sciences, earned his Ph.D. in physics at Harvard in 1980. Brett C. Sweet, M.B.A. ’00, who joined the Faculty of Arts and Sciences (FAS) as dean for finance and administration last September—just in time to help the faculty come to terms with the severe pressures and budget reductions caused by the declining endowment—departed in July to become vice chancellor and chief financial officer of Vanderbilt University. He had been at Baylor College of Medicine before coming to FAS. Dean Michael D. Smith said Sweet had been “instrumental” in helping to guide and shape the restructuring of FAS, and in major projects such as renovating biology laboratories to accommodate Harvard’s stem-cell researchers. While a search for a successor is under way, Cathy Gorodentsev, formerly the executive vice president’s chief of staff, will oversee FAS’s administrative functions; the finance and buildings units will report directly to Smith. Radcliffe fellows. The Radcliffe Institute for Advanced Study has announced its resident fellows for the 2009-2010 academic year. There will be 42 fellows (chosen from 853 applicants)—about 20 percent fewer than last year, reflecting budget constraints. Seven faculty members won fellowships: materials scientist Joanna Aizenberg, video artist Lucien Castaing-Taylor, historian of science Peter Galison, economists Jerry R. Green and Daniel A. Hojman, drama and literature scholar Elizabeth D. Lyman, and biogeochemist Ann Pearson. Two scholars at risk will be identified following their safe arrival in the United States. See the full list at www.radcliffe.edu. Press, politics, public policy. The Harvard Kennedy School’s Shorenstein Center on the Press, Politics, and Public Policy has announced its Rosenthal Writer-in-Residence Program, honoring the late A.M. Rosenthal, former executive editor of the New York Times. It provides an annual $30,000, one-semester residency for an established writer who is pursuing work on a book concerning the center’s fields of interest. By the numbers. Harvard School of Public Health has appointed Giovanni Parmigiani professor of biostatistics and chair of the department of biostatistics and computational biology at Dana-Farber Cancer Institute. He applies statistical methods to assess biomedical data, particularly for predicting cancer risks. Francesca Dominici has been appointed professor of biostatistics; she analyzes the health effects of air pollution. The couple were previously at Johns Hopkins. Emergent engineers et alia. The Presidential Early Career Awards for Scientists and Engineers—the federal government’s highest honor for promising young researchers—has been conferred on Beren professor of economics Roland G. Fryer Jr.; Nonie Lesaux, who holds the Kargman chair in human development and urban education advancement; associate professor of electrical engineering Patrick J. Wolfe; and assistant professor of electrical engineering Robert J. Wood (of robotic fly fame: see “Tinker, Tailor, Robot, Fly,” January-February 2008, page 8).